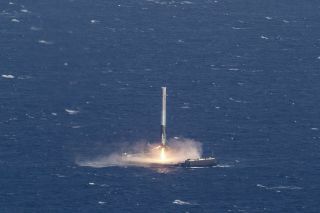 With stunning precision, a SpaceX Falcon 9 rocket touches down on a drone ship landing platform in the Atlantic Ocean after launching a Dragon supply ship into orbit and returning to Earth on April 8, 2016. From the launch into orbit to the trip back to Earth, the views of SpaceX's historic Falcon 9 rocket landing at sea on Friday (April 8) are spectacular, to say the least. First there was SpaceX's live video feed of the Falcon 9's drone-ship landing on the Atlantic Ocean after the booster successfully launched a Dragon cargo ship into orbit. Then came official launch photos from SpaceX and NASA. And finally, on Sunday (April 10), the uncrewed Dragon arrived at the International Space Station, where astronauts snapped stunning photos of the craft as it delivered nearly 7,000 lbs. (3,175 kilograms) of science gear and supplies. It all began, as space missions generally do, with liftoff. On Friday at 4:43 p.m. EDT (2043 GMT), the nine Merlin engines on SpaceX's Falcon 9 rocket first stage roared to life at Space Launch Complex 40 of Florida's Cape Canaveral Air Force Station, sending the booster and its Dragon payload on their way to space. Of the many launch photos from SpaceX and NASA, the one above is our favorite because it gets up close and personal with the Falcon 9 as it leaves its pad. Sometimes, a wider view helps set the scene for a rocket launch. Of the many images from SpaceX and NASA, this one wins for us because its vantage point. The Falcon 9 is caught in mid-roar above the launchpad as its exhaust plume expands on the pad itself. And the reflection of the engine plume on the surrounding wetlands is just stunning. NASA photographer Kim Shiflett captured some stunning close-up views of Falcon 9 streaking into space, including the one above. The photos show the rocket streaking into a blue sky, riding a pillar of flame as it heads into orbit. Here, two of the the rocket's four landing legs can clearly be seen in a visual preview of what is still to come. Speaking of streaks, SpaceX captured this one as the Falcon 9 and Dragon ascended into the sky. The image is a long exposure that transforms the engine plume into a smooth, curved streak. About 10 minutes after liftoff, Dragon reached orbit and separated from the Falcon 9's second stage just as expected. Here you can see Dragon as it appeared to the second stage booster, with an absolutely stunning view of the Earth below. Shortly after this view was taken, the spacecraft unfurled its wing-like solar arrays and began its two-day trek to the space station. Even before Dragon separated from the Falcon 9's second stage, the rocket's first stage was already headed back to Earth. The so-called boost back phase culminated in what you see above, a view of Falcon 9 — its aft spouting flame — as it battled 50 mph (80 kph) winds to fly itself down to the drone ship pad "Of Course I Still Love You." The Falcon has landed! SpaceX has successfully landed a rocket on solid ground before (back in December 2015 at Cape Canaveral Air Force Station), but this was the first successful drone ship landing after four failed attempts. To say there were cheers at SpaceX's mission operations centers in Florida and California (the company is based in Hawthorne) is an understatement. The teams were ecstatic as SpaceX's video feed showed. While SpaceX basked in the success of its ocean rocket landing (a feat that drew praise from President Barack Obama, among others), Dragon was steadily making its way to the International Space Station. That trip ended early Sunday morning, when the spacecraft made its rendezvous with the orbiting lab — as this image from NASA astronaut Tim Kopra on the station shows. Kopra posted some amazing photos of Dragon's approach to the space station on Twitter (he's @astro_tim), including this one of the spacecraft shrouded in darkness as its red and green running lights cast an eerie glow. Kopra monitored the vehicle's approach while crewmate Tim Peake of the European Space Agency worked to capture Dragon with the station's robotic arm. To capture Dragon with the robotic arm, Peake worked in the Cupola — a many-windowed observation deck on the space station. This view is looking out through the Cupola's central window. Part of the space station's 57-foot (17-meter) Canadarm2 robotic arm can be seen in the window at lower left. Kopra posted this photo of Dragon on Twitter. Kopra wasn't the only one snapping photos of Dragon as it neared the space station. On Sunday afternoon, Peake posted this photo he captured and added that it hid a surprising find. In addition to Dragon, Peake managed to capture the artificial islands of the Palms in Dubai. You can see them here by following the coastline up from Dragon's right solar array until you see the familiar flower-like islands. "I've been waiting to get a pic of The Palms, Dubai & then this happened just prior to capture ;) #LuckyDay," Peake wrote on Twitter (you can find him at @astro_timpeake). Finally, at 9:57 a.m. EDT (1357 GMT) on Sunday, Dragon was attached to an Earth-facing port of the station's Harmony module, where it will stay for about a month. This view also captures a bit of history in the frame. To the right of Dragon, with its unique round solar arrays, is an Orbital ATK Cygnus spacecraft — another private cargo ship that launched cargo to the station for NASA on March 22. At the far right side of the image is a Russian Progress cargo ship that launched on March 31. Dragon's arrival marked the first time that two privately built spacecraft were docked at the station at the same time. With two U.S. cargo ships, two Russian Progress spacecraft and two Russian Soyuz crew capsules, it's also the first time six spacecraft were simultaneously visiting the space station since 2011. In May, SpaceX's Dragon will be detached and set free so it can return some experiments and other gear to Earth. Its return to Earth will mark the end of SpaceX's eighth cargo mission for NASA. Email Tariq Malik at tmalik@space.com or follow him @tariqjmalik and Google+. Follow us @Spacedotcom, Facebook and Google+. Original article on Space.com.